Congratulations to all Wilcox Academy Students who participated at the District III Art Show last week!!! We are taking a great group of artists and artwork to the AISA State Art Show, which will be at Auburn University at Montgomery, Taylor Center on April 17, 2019. The public viewing will be from 12:00 p.m.-12:30 p.m.
Wilcox Academy students took away Best of Show and Best of Dision Awards. 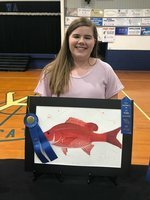 Congratulations to Samantha Cook for Winning Best of Division for Grades 4-6 and Best of Show for Grades K-6 for her 3D Clay Teapot; and to Mary Forrest Bell for winning Best of Division for Grades 7-9 for her Painting of a Salmon - Great job ladies and Good Luck at State next week!!! WA Students Win at District III Art Show Wilcox Academy 2019-20 Cheerleaders ANNOUNCED Duke Talent Search Wilcox Wildcats Pep Club WA Prayer Walk Congratulations! Congratulations to our 2017 Homecoming Court Congratulations to our AISA State Art Show Winners! CONGRATULATION TO OUR SPELLING BEE PARTICIPANTS CONGRATULATIONS TO ANNA LEIGH McGRAW Grandparents’ Day Celebration Congratulations to Our New Junior and Senior Beta Inductees Seventh Graders Qualify for the Duke Talent Search Congratulations, State Art Show Winners!! Congratulations, State Art Show Winners!! Congratulations, Sheridan Jenkins and Bennett Brantley! Congratulations to Addy Crabtree! State Champs! VARSITY GIRLS’ BASKETBALL CONGRATULATIONS, WA SCIENCE FAIR WINNERS CONGRATULATIONS, MATH TEAM CONGRATULATIONS, ALL-STARS CONGRATULATIONS, CHEERLEADERS CONGRATULATIONS, WEIGHT TEAM 2015 Spelling Bee Winners DAR Essay Winners CLASS OF 2015 SUPERLATIVES! JV Girls are State Champs! Miss Wilcorama Winners AISA West All-Star Players Mandy Jordan signs with Lipscomb University Congratulations!!! Get your game face on! SGA Events Dress Up Days for the 2014 Football Season Congratulations JV Cheerleaders! Congratulations WA Varsity Cheerleaders!